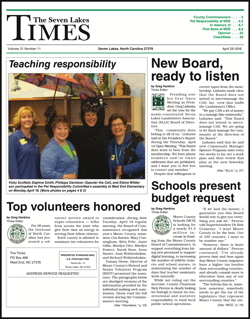 The Times reaches every household in Seven Lakes — North, South, and West (Beacon Ridge) — as well as in Foxfire Village, McLendon Hills, and the fast-developing Eastwood-Murdocksville area. The Times is mailed to those 3,100 households through the US Postal Service, reaching local mailboxes every other Friday. We mail another 700 copies to folks outside of that core distribution area — mostly non-resident property owners. And we distribute 400 additional copies for pick-up in Seven Lakes businesses. That's a total circulation of 4,200. There is no more effective way to reach this vibrant, fast-growing part of Moore County. Seven Lakers have depended on The Times for more than 25 years. Click here to download a rate card and publication calendar. Our Classified line ads are only $1 per line, with a $3 minimum charge. And we'll email you a price and arrange for payment.